Our Uncle Personalized Picture Frames make a great gift for a new or favorite Uncle. Create a lasting personalized keepsake sure to warm your Uncle's heart and bring a great big hug. Your Engraved Uncle Customized Picture Frames measure 12 3/4" x 10 3/4" and holds a 10" x 8" photo. Easel back allows for desk display or can be wall hung. Engraved frame for Uncle includes FREE personalization! 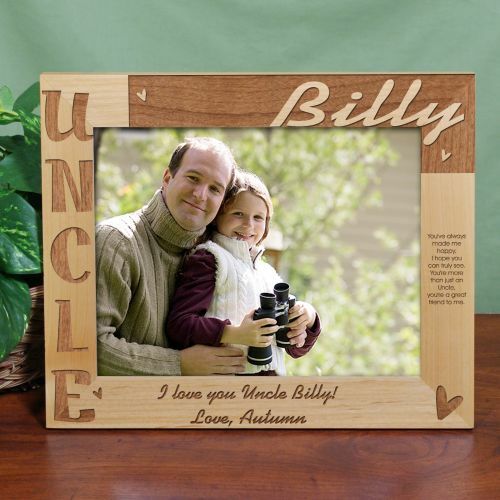 Personalize your Uncle Picture Frame with any name and any two line custom message. Please choose I or We for the Uncle poem. But you’re so much more you see. And I love when you’re with me.